Scottsdale Window Tint . . .
SunTek Carbon XP window tint is designed to make you look hot while you stay cool! SunTek Carbon XP window tint means quality and value. Scottsdale Window Tint .com is conveniently located in the Scottsdale Airpark office area right off the 101 and Raintree exit. 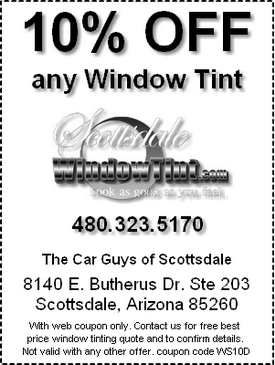 We have been window tinting specialists now for over 20 years and offer great prices and excellent service for all your Arizona car and truck window tint needs. We exclusively sell and install SunTek Carbon XP window tint that offers our customers a no fade nationwide lifetime warranty with no signal interference guaranteed!